Hip Internal Rotation: You Need It. All human movement can be described in three dimensions. We move in the saggital plane (front/back), frontal plain (side-to-side), and the transverse plane (rotation.) Certain movements are one-plane dominant: Distance running is mostly a saggital plane movement. Swinging a baseball bat is mostly a transverse plane movement. Ice skating and rollerblading feature a lot of frontal plane movement. Still, each of these movements also contain elements of the other two planes. In my observation, a lot of people lack movement skills in one or more of these planes. Many times it seems clients lack adequate transverse plane movement, especially in the hips where the femurs attach to the pelvis. (We describe transverse plane hip movement as internal and external rotation.) If we lack good transverse plane hip movement then we may have trouble with all sorts of activities from walking to running to skiing to golfing. Poor transverse hip mobility may result in back pain, knee pain or even shoulder or neck pain. Restricted transverse plane movement may also negatively impact sports performance. I’ve found that restrictions in the transverse plane are often hidden. 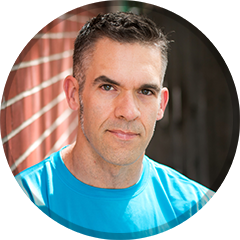 , Many people may feel tight hamstrings, tight pecs, or tight neck and upper back muscles, but rarely do I hear encounter a client who’s aware of something that doesn’t move well in the transverse plane. It seems a lot of us are walking around with no clue that we lack adequate rotation in any of our joints. Why might an individual lack internal or external rotation? It could be any number of reasons. I believe our modern, seated, immobile lifestyle is probably a major contributor. Other reasons could be an anteverted or retroverted femur. These are structural issues of the femur that can’t be changed. Some sort of past injury could also be a culprit. All three issues could be at play. I rest my case that hip internal and external rotation is important. Here’s a video discussing hip internal rotation, why it’s important, and how to achieve it. Live it up kids!